Remotely sensed data is widely used in the forestry sector. This information has been largely sourced from satellite or airborne sensors, but recently unmanned aerial vehicles (UAVs) have emerged as a new platform for acquiring remotely sensed data. In contrast to satellites and aircraft UAVs are relatively inexpensive and can be rapidly deployed to collect data for repetitive forest activities. These craft currently have restricted flight times and payload capacity, limiting the potential range of applications and the type of sensors that can be carried. These attributes are likely to see UAVs fill a niche for the collection of remote sensing data to serve a variety of novel applications. The results of the study showed that UAV data collection and subsequent analysis can be used for rapid assessment of post-storm wind damage in forests and for updating stand records. Automated cutover detection to monitor harvesting progress using edge detection algorithms was tested and showed that imagery from inexpensive UAVs could be used to accurately map forest cutover boundaries. The UAV system developed showed potential for regular, automated updating of cutover boundaries. For planting stocking and survival assessments, the project showed that reliable estimates of stocking and establishment success can be made from the data collected from UAVs. Evaluation of UAVs for post-harvest waste assessment showed that the imagery appeared well-suited to the assessment of post-harvest waste volume. While sweep could be accurately assessed, material covered by slash and defects such as rot could not be easily detected from UAV imagery. Figure: Left panel shows the UAV flight path (dotted green) and heading (blue lines) determined by edge detection. 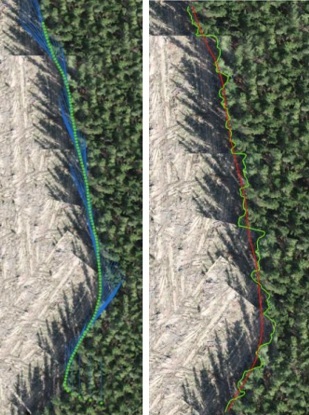 Right panel shows the smoothed flight path (red) compared to the actual edge determined from ground-truth mapping (green). Overall the results showed that UAV imagery is potentially suitable for the forest management applications assessed, and that UAVs fill a niche in terms of remote sensing data that is not currently served by other platforms. This article is based on the work of Dr Grant Pearse (grant.pearse@scionresearch.com) and Dr Michael Watt (michael.watt@scionresearch.com) from Scion and David Hunt from Canterbury University. The project was funded by the Forest Growers Levy Trust and Scion.